BOUNCE !!! : @ GAROROCK OFFICIAL AFTER PARTY!!! 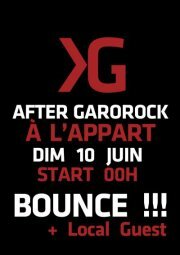 @ GAROROCK OFFICIAL AFTER PARTY!!! .FR. Ce week-end, RDV @ Marmande pour le GAROROCK, certainement le plus gros Festival du Sud Ouest de cet été 2012 !!! 3 Jours de Folie Furieuse du 8 au 10 Juin avec notemment Cypress Hills, Foreign Beggars, C2C, Dirtyphonics, Puppetmastaz, Tha Trickaz, Nofx, The Hives, et beaucoup d'autres, ... ainsi que ... BOUNCE!!! qui clotureras les "hostilités" dimanche à partir de Minuit à l'after officiel du Festival !!!!!!! .UK. Here we are !!! Next week-end is ringing GAROROCK FESTIVAL @ Marmande, truely the French south west largest event on this summer 2012 !!! 3 days of total madness from the 8th to the 10th of June, starring Cypress Hills, Foreign Beggars, C2C, Dirtyphonics, Puppetmastaz, Tha Trickaz, Nofx, The Hives, and many others, ... as well as ... BOUNCE!!! who will end "hostilities" on sunday from midnight, for the Festival official after party !! !